In 2013, the Tile Council of North America (TCNA), the organization that sets the guidelines for tile installations, is rumored to have made a modification to their specifications for constructing tile steam showers. It’s all about perm ratings- and Schluter Kerdi fabric no longer cuts it. Perm ratings are used to measure vapor permanence- basically how well steam passes through the wall. Kerdi is rated at 0.75 perms. It used to be that anything under 1.0 perms was OK to be used in a steam shower. But this year the rules committee lowered the perm rating to 0.50 perms (test E-96 procedure E). While Kerdi board (0.48) squeaks through, the Kerdi membrane does not. 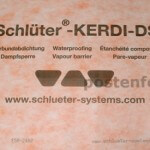 Thankfully Schluter already manufactures a product that can be used under the new steamer requirements: Kerdi DS. Manufactured for steam showers in Europe, DS has a perm rating of an impressive 0.18. The tradeoff is that the DS material, at 20 mils thick, is quite a bit thicker than normal Kerdi at 8 mils. Additionally, there are other products available for use in commercial steam showers such as Nobleseal TS. New products and with new technology are coming out all the time so be sure to check the manufacturer’s data sheets for use in steam showers. Keep in mind that these new specifications are for commercial steam showers only. 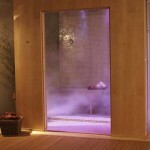 A steam shower is a type of shower that has a steam generator inside of it. Schluter’s Kerdi is still a great product for a normal everyday shower and is a product I would highly recommend for that purpose. Admin note: As mentioned in the comments, this new rule will only apply to commercial (high use) steam showers. Thanks to John Whipple for this update. Nice post. I have some Kerdi DS in stock here in Vancouver. Let me know if you want a product sample for your work truck. I’ll be covering this new membrane next week at Build Ex if you want to drive up. Feb 14, 2013 First thing in the morning. The new specification only applies to high use and commercial steam units. Thanks John. That’s good info. I have yet to see the new rule in writing but I have heard from TCNA committee members that it’s in the new book. If you must use Kerdi then use Kerdi DS. If you want to follow the TTMAC and TCNA spec’s about using modified thin-set then use Ardex’s line of products. You can call Ardex technical and get their recommendations for the right thin-set for a Kerdi installation. X77 and X5 are two options here. Of course Ardex will allow this and warranty the shower build for you. Or easier still use Noble Company’s NobleSeal TS and then work with any company for thin-set. Our Vancouver builds get NobleSeal TS and Laticrete setting material. I worked with Kerdi DS for just over a year plus and a few weeks back made the choice to quit working with the products from Schluter all together. Currently I’m testing the product’s from Dural. I agree that the cheapest unmodified mortar at HD is not a good idea to use. When I install Kerdi I use Ditraset by Bostik. There’s other good ones out there also.